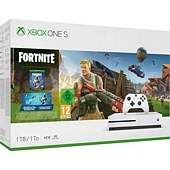 Cheap Xbox One S 1TB Fortnite Console with Eon Cosmetic Set & 2000 V-Bucks Game - Price comparison at over 30 UK retailers. Amazon UK £235.00 £0.00 £235.00 Temporarily out of stock. Order now and we'll deliver when available. We'll e-mail you with an estimated delivery date as soon as we have more information. Your credit card will not be charged until we ship the item.